The long-lasting battery, well judged active noise-cancellation, wire-free use, included carry case and lightweight design will make the N60NC Wireless a solid headphone choice for travellers. When it comes to noise-cancelling headphones for travellers there are many premium options. The AKG N60NC Wireless cut the necessity for wires in these established noise-cancellers — although a 3.5mm cable is included, as backup — in a lightweight, portable on-ear design. But are they the best cans for travelling to choose? Straight out of the box the AKG N60NC Wireless make clear these cans are for those on-the-go types: the included soft carry pouch contains the headphones, which fold upwards toward the headband for a compact design. Compact is a theme: the AKG N60NC aren't especially large, unlike chunkier over-ears, instead designed to reside on the ears, as their on-ear designation makes clear. The earcups are soft and squidgy, thanks to memory foam coated in leather, so wearing them is immediately comfortable — and without excessive noggin' pinch. There's an adjustable aluminium band with 10 points of adjustment, which looks very tidy, and there are no exposed wires to be seen anywhere. This all means the design is relatively understated, which works well except for the exterior panels of the earcups — these plates looks plastic, despite their attempts at looking metallic, with an AKG logo centred within each. Still, that helps to keep the weight down. In context, the Bose QuietComfort 35 actually look more plasticky overall. 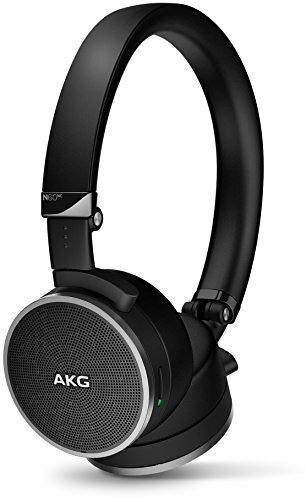 The AKG features physical controls on the right earcup, with individual volume up and down, a Bluetooth/noise-cancelling on/off switch, plus a track skip forward/back switch. Grabbing at these controls is easy enough, although we tended to just control things from our host device as applicable. The opposite earcup hosts the cable input, if needed, and the USB-C charging port. The AKG N60NC on-ears claim lofty low-end ability with a 10Hz response at the low-end of the frequency range. That seems well off the mark to our ears, as these aren't nearly as bass capable as plenty of other headphones we've reviewed in recent times. Part of the problem is with positioning. Sure, the N60NC are comfortable on the ears, but the small openings in the earcups aren't particularly good for delivering direct sound, which leaves the bass levels sounding slightly disengaged when considered against other competitor products. In isolation they sound fine, but they're not miracle workers for bass. That affects the perceived quality in our view. Sure, there's Bluetooth aptX for lossless playback — although it's not better-still aptX HD for high-resolution playback — but the way the drivers seem a little more distant from the ear canals presents some limitations with overall engagement. Press the earcups against the ears and the profile changes completely for the better — but as that's not how these headphones fit, that's not what you'll hear most of the time. The N60NC Wireless' noise-cancellation is also of the more subtle variety. How you feel about this will depend on preference: at one end of the scale you've got the likes of Audio-Technica, which makes noise-cancelling cans that are great to remove the "hiss" you tend to hear in flights (see ATH-MSR7NC); at the other end of the scale is Bose, which offers intense noise-cancelling, as if you're in an audio vacuum (see QC35). AKG is sort of in the middle, offering active cancellation that cuts out some unpleasantries without overdoing things — which we think is a good balance. Then there's battery life, which over our weeks of use we've found to last for a couple of working days, around the 14-hour mark of non-stop locked-into-the-zone listening. Which is great news for long-haul flights, commutes and so forth. Recharging via the USB-C port is nice and easy too. The long-lasting battery, well judged active noise-cancellation, wire-free use, included carry case and lightweight design will make the N60NC Wireless a solid headphone choice for many travellers. However, in the noise-cancelling market the N60NC Wireless' main competitor is the Bose QuietComfort 35. Both are quality products in their own regard, with the AKG being the better looking of the two in our view. However, the QC35's open earcups deliver a more direct-to-the-canals listen and more intense noise-cancelling, which we find makes for a more engaging listening experience. Overall the AKG N60NC Wireless offer aplenty, but the fit doesn't deliver as enthralling a sound profile as the spec sheet might suggest. That's what holds them back from greatness. If you're after the ultimate in intense noise-cancellation so you can't hear a peep from anyone else around you then Bose hits the nail on the head with the QC35. They're a bit plasticky in build, but still impressive in sound delivery.